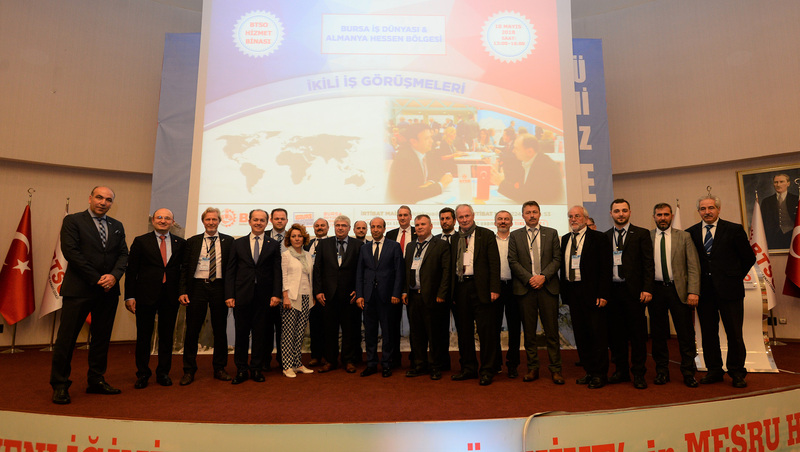 Bursa Chamber of Commerce and Industry (BTSO) realized an event which will empower economic relations between Bursa and its sister state Hessen in Germany. Approximately 40 business people from Hessen Region has laid foundations of new collaborations at the gathering with members of BTSO. BTSO continue to make moves in order to increase the foreign trade volume of Bursa. BTSO has gathered over 16 thousand foreign buyers with its members in Bursa through foreign buyer delegation programs which organized within the scope of Commercial Safari and Development of International Competitiveness (UR-GE) projects has recently welcomed a delegation of 40 business people from Hessen, Germany. The b2b even has been organized in collaboration with MUSIAD Hessen Branch and attended by Mr. Aytuğ Onur, Mr. Haşim Kılıç and Mr. Muhsin Koçaslan; Members of the Board of Directors of BTSO, Mrs. Gülçin Güleç Uçar; Clerk of the Assembly of BTSO, Mr. Musa Aydın; President of MUSIAD Hessen Branch and representatives of over 100 companies from Bursa. As Mr. Aytuğ Onur; Member of the Board of Directors of BTSO stated that Germany is the most important trade partner of Turkey during his opening speech. He continued by saying that the trade between Bursa and Germany is developing day by day and reminded the fact that Bursa has realized 2-billion-dollar worth of export to Germany in 2017 and collaborative work of establishments such as BTSO and MUSIAD Hessen has significant roles in this success. “MUSIAD branches are one the most important stops for us to visit during our abroad visitations. We work in solidarity and harmony on behalf of the development of new collaborations. The bilateral meeting, we have realized today is a proof of our good relations. We will continue to work for the development of bilateral trade between Hessen and Bursa. Mr. Musa Aydın; President of MUSIAD Hessen Branch provided valuable information about Hessen Region in Germany during his speech and stated that Hessen is the 5th largest region in Germany with a total trade of 60 billion dollars. The trading volume between Turkey and Germany is at the level of 2,2-billion-dollars. Mr. Aydın also expressed that the current trading volume must be increased in the future. After the opening speeches delegation from Hessen Branch and representatives of Bursa business world have sat down for b2b meetings.